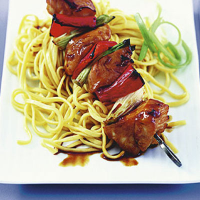 Yakitori is Japanese for marinated chicken kebabs. We have added vegetables to this easy low fat dish. In a large bowl, mix together the soya sauce, mirin, honey, ginger and garlic. Add the chicken and stir well. Cover and leave to marinate in the fridge for 1-2 hours or overnight. Preheat the grill to high. Thread the chicken, salad onions and pepper pieces alternately, dividing them between 4 metal skewers, reserving the marinade. Place the kebabs on the grill rack and brush liberally with the marinade. Cook for 10-15 minutes, turning occasionally and basting with the marinade. The chicken should be cooked until the juices run clear and there is no pink meat; the vegetables should be lightly charred. Serve immediately, with Waitrose Medium Egg Noodles, garnished with salad onions. If you are short of time, marinate the chicken for just 20 minutes - it will still absorb a lot of the flavours. Try using a different selection of vegetables, such as yellow peppers and courgettes.